Inspired by Joergen Leth’s 1967 short film “The Perfect Human” and Lars von Trier’s “The Five Obstructions” (2003). This performance intends to create a sixth obstruction of The Perfect Human, by introducing rules in order to complete the performance as a game. In preparation for the game the performer receives a suitcase, one week in advance. 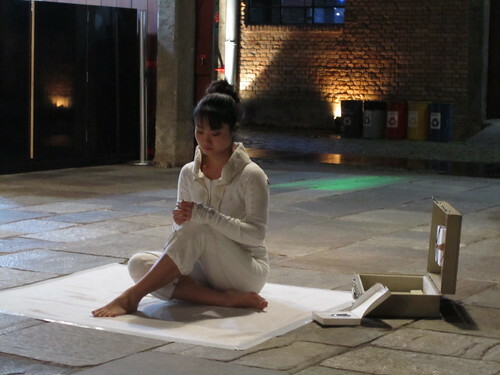 The artists do not meet or talk with the performer until the day of the performance. The Suitcase contains items selected to help the performer prepare herself for the game. None of the items impose any obligation on the performer. Instead she is free to inspect and make use of them in any way she sees fit. But she must prepare herself. 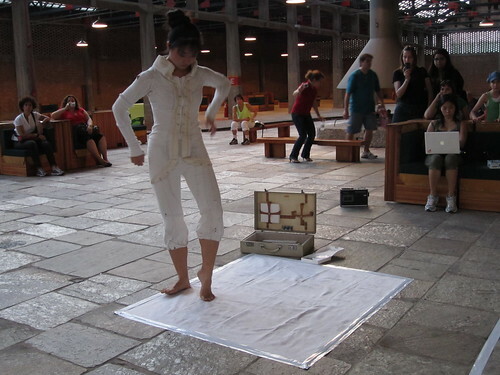 On the day of the performance, the performer must show up at the named time and location carrying the suitcase with all its contents. The game begins as the performer starts putting on the socks, the last item of the costume. During the performance the performer reaches a point in the game, where she must mirror the audience in order to complete the level. 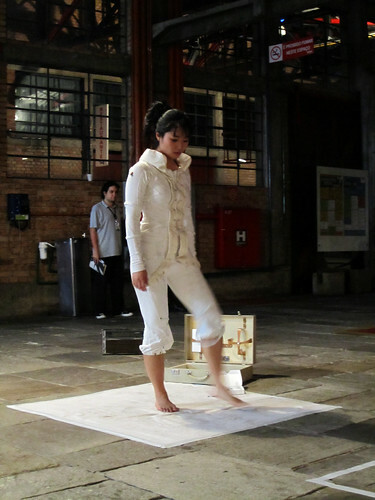 This allows the audience to explore the wearable motion-capture system through the mirroring of movement. Moreover the audience must themselves become involved in order to perform the role of the perfect human. 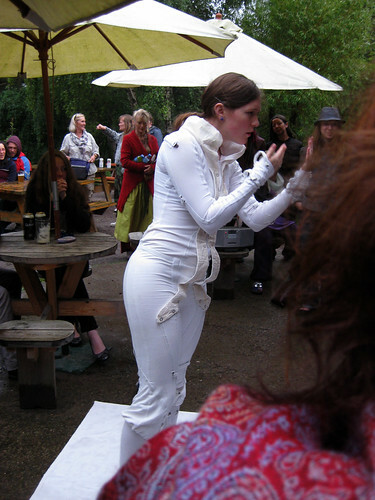 The actual performance takes place in public space. The setup is fully portable by the artists and performer. The performer wears a handmade motion-capture costume that includes fabric bend sensors for tracking the motion of the limbs and wireless communication to send the sensor data from the suit to a nearby laptop. Software on the laptop analyzes the sensor data and triggers words from The Perfect Human text. An FM radio transmitter broadcasts these words to surrounding radios, which are tuned to the frequency of the FM transmitter. The radios play back the sound for everybody to hear. The Perfect Human performance has developed over time. Not all previous performers received the suitcase for preparation in advance. Ivana is a dancer, performer and choreographer who studied German and history in Croatia, and dance in Austria. She lives and works between Croatia, Austria and Germany.